Last week sometime I saw a Pintester post that called for a test those pins we’ve always wanted to try, but didn’t get to just yet for whatever reason. I figured why not? 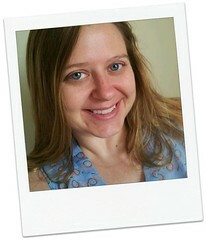 It’d be an excuse to actually do something from Pinsterest…you know, for my blog. Do I know how to motivate myself or what? Don’t answer that. ANYWAY! I didn’t really have all the ingredients – technically – and well, I was tired after swimming lessons yesterday and didn’t want to go to the store. Plus there was a really bad storm around here last night. I had two options, do the math to make it work for what it said or work with what I had on hand. See point about being tired, so instead of doing math, I raided my cupboards to see what I had on hand. What I had was 2/3 of the white chocolate or enough if I used the orange chocolate melts (color, not flavor). I can deal with orange colored candy! Right? The other substitution I made was for the condensed milk. I only had fat free sweetened condensed milk so it was going to have to do, but it all went in the pan per the instructions! I melted, mixed, poured and let set. It sort of looks like baby barf, maybe orange wasn’t the best color. I tried the melted goo and well, it wasn’t awful. I was still hesitant that this would actually work and had to put it in the fridge overnight to set. BUT! It doesn’t totally taste like Bailey’s but it didn’t taste terrible either and there’s a really nice aftertaste. And a little zing. I fed it to some coworkers and they decided it was awesome so although it looks weird? I’m calling a win. I suppose I’ll try the Kahlua one next. I do love me some Kahlua. Well Sonja, I hope I made you proud! 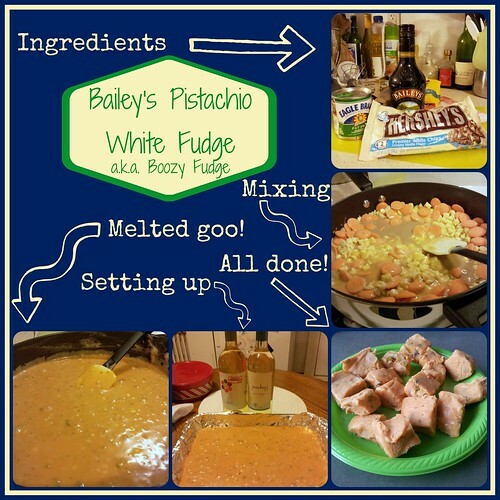 This entry was posted in Baking, Friday Yummy, Project Pinterest and tagged Baileys, boozy candy, fundge, looks weird, Pinterest, pintester, pistachios, winning. Bookmark the permalink. 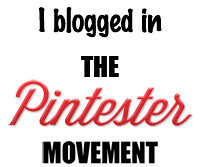 11 Responses to The Pintester Movement! 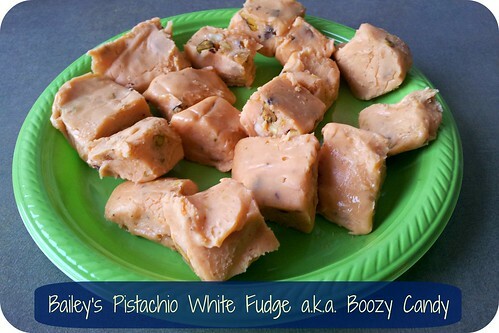 Boozy Candy, say what? So awesome! Thanks for testing and participating! Eep! it does look a bit sketchy, but sounds delightful. I might have to give it a try. I think you should start a new Pinterest Board called “Really Tasty Food Made By Garbage Pail Kids” 🙂 I am looking forward to tasting the semi-hard barfy deliciousness. 🙂 p.s. Emmy will LOVE it because it is pink, but don’t know if it is safe for a 2 year old to eat? No fair. Every time I try to use candy melts in lieu of white chocolate, I wind up with a big old mess of ickiness. I’m going to have to try this anyway. If you have to do it in the microwave, try no more than 15 seconds at a time. Stirring after every zap. It takes forever. Good luck. Boozy fudge was totally worth it.